WBC No. 1 featherweight Mark Magsayo of Tacloban City, Leyte, hasn’t fought in over a year and the inactivity has resulted in the WBO dropping him from No. 1 to No. 8. If he continues to stay idle, it’s likely the WBC will take away his No. 1 rating, too. Magsayo was once ranked No. 7 by the IBF but now isn’t in the top 10. As the No. 1 contender, Magsayo is the mandatory challenger of WBC champion Gary Russell, Jr. He’ll lose the right to challenge Russell once he moves down the ratings because of inactivity. Russell, 30, is a southpaw from Washington, D. C. with a 29-1 record, including 17 KOs. Magsayo’s record is 18-0, with 13 KOs. He’s the reigning WBO International featherweight king. Magsayo, 23, is in court over a contractual dispute with ALA Boxing. 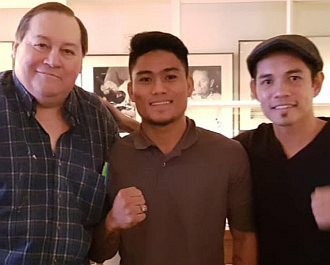 He claims his five-year promotional contract with ALA Boxing expired last May but ALA Boxing insists the contract was renewed for another five years. Last September, Magsayo flew to Las Vegas with wife Frances who takes care of his business affairs. He recently signed a contract with Vikram Sivapragasam of Malaysia’s Vladimir Boxing as manager and Cameron Dunkin of Now Boxing as promoter. Dunkin operates out of Las Vegas and his stable includes Nonito Donaire, Jr. While in Las Vegas, Dunkin arranged fights for Magsayo in Mexico and Texas but neither pushed through. According to Magsayo, his opponents backed out but he was paid a penalty fee. ALA Boxing president Michael Aldeguer said the fights were cancelled because of Magsayo’s contractual issues. ALA has a respected reputation in the US and Mexico. Promoters are hesitant to engage Magsayo out of respect to Aldeguer. With no fight contract on the table, Magsayo and his wife returned to Manila last Dec. 26. He now trains by himself at the Elorde gym in Gilmore, not knowing when he’ll fight again. Promoters here and abroad aren’t touching him with a 10-foot pole and he’s wasting his prime years as a fighter staying idle. Magsayo said he receives a monthly salary from Dunkin so there’s always food on the table. But how long will this accommodation last if he doesn’t fight? GAB chairman Abraham Mitra said he has tried to settle the disagreement between Magsayo and ALA but to no avail. While Magsayo is in limbo, another Filipino is climbing up the featherweight ranks. Genesis Servania, 27, is now ranked No. 1 by the WBO, No. 5 by the IBF and No. 3 by the WBA. His record is 32-1, with 15 KOs. The only loss was a decision to WBO champion Oscar Valdez whom he floored in the fourth round in Carson City, California, in 2017. Servania will battle undefeated Carlos Castro of Phoenix in a tenner in Fresno on Sunday and a win should seal a rematch with Valdez as mandatory challenger, a position Magsayo would’ve been in if not for his contractual dispute. Perhaps, the GAB should determine whether or not ALA has an existing promotional contract with Magsayo so the issue doesn’t drag in court. Once that’s determined, the GAB should decide how to reconcile the differences between Magsayo and ALA with the goal of getting the fighter back in the ring as soon as possible. Photo: Mark Magsayo (C) with promoter Cameron Dunkin (L) and Nonito Donaire Jr.